Similar structure ba ito sa mga games tulad ng Metal Gear Solid V o Assassins Creed games? I would say it gets a lot of mission types from both games and some elements from games like the witcher. This game haz amazing combat though, far better than all those games i mentioned above. Going up against the larger machines in this game was some of the most fun combat i've encountered. 50 plus hours in and at 53% completion. So many side quests to finish. And I thought it would be that easy to obtain the ancient armor. Gotta try this game. Thanks for the info. Glad I finished this in time for Mass Effect, I have a few more side missions to finish before I sell the game (maybe) - may confirmed expansion na eh, so that may mean that I hold off on selling the game first. 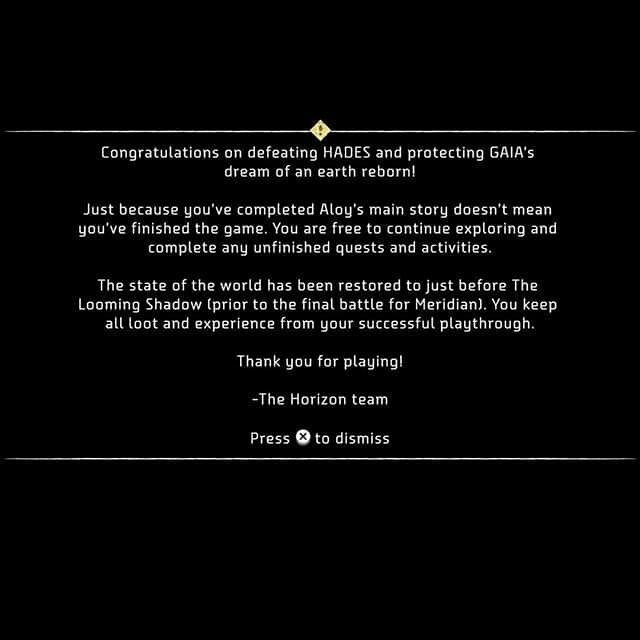 Finished after 120 hours! 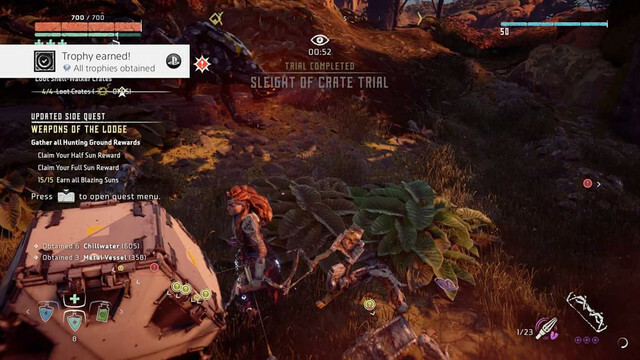 Only two more Hunter Trials trophy to get the Platinum. Amazing game! Now, on to Persona 5 on Tuesday. Oh, here's one tip I just realized while I'm doing the Hunter Trials to get the trophy. You can dial down the difficulty to easy so you wouldn't have a hard time taking down some of the machines. Dapat sana lahat ng games nagsesend ng ganito kapag na-complete mo na yung game. Is it too much to ask for devs to reward players getting the Platinum trophy a free theme? 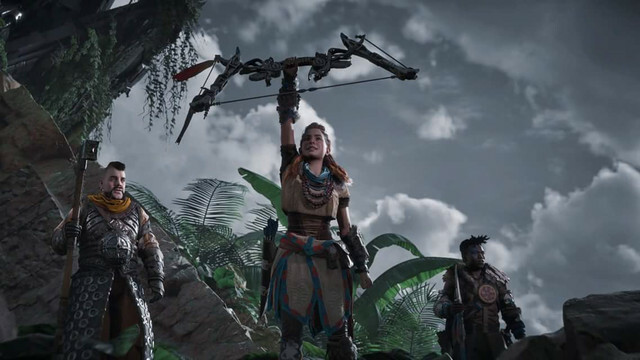 We’re pleased to announce that Patch 1.30 for Horizon Zero Dawn will be released today. In addition to fixing a number of progression issues, technical issues and crashes, as outlined below. 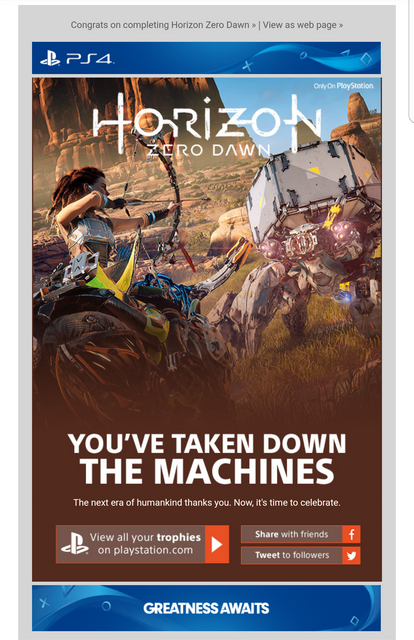 If you encounter an issue while playing Horizon Zero Dawn, please try reloading a recent manual save, quicksave or autosave from the “Load” menu option. If the issue persists, please take screenshots of the area where it occurred and your location on the map, and forward them to us for further investigation. The game that keeps on giving! Time for a replay! Uhmm. More like Monster Hunter and Dark Souls/Bloodborne. Pero pwede ka rin maging sneaky killer tulad nung sa assassins creed kaso mejo mahirap para sakin kasi maikli lang ang aking pasensya. 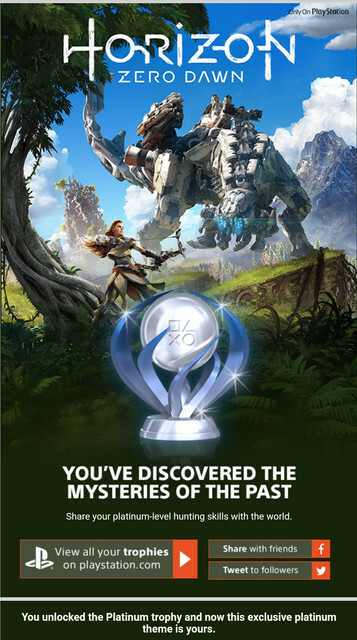 I'm back ask ko lang if yung 3001395 disc code ng HZD ko ay US compatible? Meron akong PS Store SG account (with PS+) but wala sa PS Store SG yung DLC na gusto ko. Nasa PS Store US siya meron. tapos nakaset naman na PS4 ko as primary console so pwede ko syang ishare right? games are region free pero region lock ang dlc. Tsaka iif ever may US PSstore account ako pwede ko naman share yung dlc sa PS SG account ko diba? 3. Do you have preorder DLC? If so, try entering the codes in R3 account, if gumana, it means region 3 yung account mo. If binili mo yan dito, it's likely that it's a region 3 game. If that's the case, then I'd just wait for the dlc to show up on the singapore store listing. Games this big will always have the dlc available on all region stores. Sony games are not region compatible sa DLC, if bumili ka ng dlc from the r1 store, hindi gagana yung dlc sa SG account mo if magkaiba region ng game and ng DLC. ang dlc sharing nga is between user accounts lang sa ps4 mo hindi between PSN accounts. Kung unsure ka pa rin research mo online.